Never one to make a brief impression, Joey Daniel is here for the long run. Perhaps a common remark in these DJ infected days, nevertheless this is an artist who's been taking his time, slowly excelling in amazing performances as well as building reputation for his renowned 300MPH events. By now, Joey Daniel has reached new heights, one of Holland's most wellknown techno artists is about to make even bigger waves. Coming from Rotterdam, where legendary names like Speedy J and Michel de Hey ruled its vibrant nightlife, it was only a matter of time before Joey Daniel would dedicate himself to techno music. From a heavy clubber he quickly took things to the stage, making himself noted with residencies in major clubs like Off-Corso and Now & Wow. In the latter venue Joey Daniel also took on the role as programmer, gaining nightlife experience before taking things into his own hands. As a result, by the time he started the notorious Selektor club events in Off-Corso, Joey Daniel had risen to become a major tastemaker in the Rotterdam techno scene -it was time to push on. Which he did by playing countless venues outside his home city, as well as starting a brand new club event: 300MPH. A monthly party, starting in Factory10, up above the famous Maassilo at the Rotterdam docks, followed by underground club Catwalk where Daniel contributed to its success with another residency. Currently residing in Tofler, a venue that has most recently shaken the city's nightlife, 300MPH has played host for many special nights. 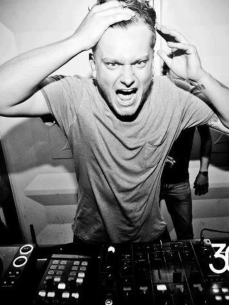 Besides doing his own sets, sometimes evolving into marathon gigs where he dives deep into his musical tastes ranging from exciting house grooves to techhouse and techno, Joey Daniel has received some interesting guests at 300MPH. Highlights among others were performances by; Loco Dice, Pan-Pot, Joris Voorn, Karotte, Martin Buttrich, Raresh, Nic Fanciulli, Tiefschwarz and tINI. It's made 300MPH one of the most popular club events in Holland, even a party with a solid reputation among the international techno crowd. As for broadening limits, so did Joey Daniel. By now he's become a household name in Dutch nightlife, a trusted provider of highly acclaimed DJ sets, playing almost every club and festival there is. He's already made a lasting impression at the legendary Awakenings techno event, as well as a mesmerizing gigs at Cocoon Holland, Time Warp Holland, Mysteryland, Welcome to the Future and the Pollerwiesen Festival in Germany. Having recently moved to Amsterdam he's evolving into new territory, spending more and more time in the studio, preparing some exciting new releases.